Our story: Once upon a midnight dreary, whilst arguing with his online nemesis, Militant Mitch, Pete instead found himself swooning over the ChristianMingle.com ad in his Facebook feed. Before you can say Shadrach, Meshach, and Abednego, he was 'matched' with Jenny Fillipi – a liberal, progressive woman of a spiritual bend - and the two of them are off on a date at The Lucky Buddha. Little does she realize his true nature, that the man sitting across from her is none other than… Pete Perkins, Presuppositionalist! "So that was when I started really getting into eastern religions," said Jenny, effortlessly twirling lo mein about her chopsticks, bringing the noodly appendages to her mouth. "Ever since my divorce, I felt like my life had been just spiraling out of control, you know? Yoga and meditation really helped. I really felt like I could hear the voice of God telling me it was going to be okay." She dabbed her lips with a napkin. "Do you know what I mean?" Pete, for his part, had not yet touched his meal. "Yoga has its roots in pagan culture," he cautioned. "It can open a person's mind to all sorts of things. It…"
"Exactly!" Jenny pointed a chopstick at him excitedly. "It did open me up! For the first time, I felt completely open! There's a book by this monk, his name is Thich Nhat Hanh. Have you ever heard of him? It's called Living Buddha, Living Christ, and it really details all the ways in which the two spiritual narratives are similar. I think the world would be such a better place if people learned that we're really not all that different from each other. Christians, Muslims, Buddhists… even atheists! We all share so much with each other!" She paused, attempting again to twirl the lo mein, then giggled as it slid off. "Anyways, I could talk all night about myself! What about you, Pete? Tell me about your spiritual life! I can't wait to hear about it!" The 'date' had been going on for approximately twenty-five minutes. Twenty-five minutes from the time he had arrived at her front door until the present moment, their meals – still steaming - having just been delivered. Pete was not a fan of Chinese food, but he'd been so entranced by this woman's seeming willingness to be in his company that he forewent his usual trepidation – though the oversized, golden Buddha in the restaurant window did give him pause. Considerable pause, truth be told. The rolls of golden, gleaming fat were numerous, and the Buddha's eyes were mere slits of unabashed contentment. By contrast, Pete thought of the crucified Christ hanging above his bed, thin and full of agony, ribs jutting through wooden flesh. It seemed an omen to him, but he could not have guessed at what it foretold. Tell me about your spiritual life, she'd said. Pete Perkins sat up straight and cleared his throat. Here we go, he thought to himself. Showtime. "I am a presuppositional apologist." He let the words hang there, by themselves, multisyllabic and impressive. "Well," Jenny said finally, "I'm not sure what that is, but it sounds interesting…"
"The best way to think of it is in contrast with evidential apologetics.," Pete immediately continued. 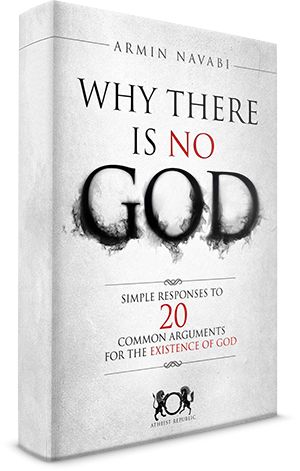 "In evidential apologetics, I would give you evidence that God exists in order to convince you. But with presuppositional apologetics, I'm telling you that you already know that God exists because otherwise you wouldn't be able to know anything!" Oh, how he'd always dreamed about saying those very words to a woman! "But… I do know that God exists," Jenny said slowly. "I told you…"
"Yes, you may believe in God, but do you presuppose his existence?" Pete scanned the table, his heart nearly beating out of his chest with excitement. He grabbed at an unused packet of soy sauce. "Suppose I wanted to prove to you that this soy sauce existed, what could I do? I could show you the soy sauce, right? I could have you taste it, you could dip your fingers into it…"
"But when I do that, I put this soy sauce on trial!" Pete shook the packet at her. "You're in effect saying that you're the judge, that you are in a position of authority over this soy sauce, and that it must conform to your standard of evidence!" "But presuppositional apologetics does away with all that! Presuppositional apologetics says, You already know the soy sauce exists! It's already a part of your worldview! We can know this because without it, nothing else makes sense!" "Everything all right?" Their waitress had returned to their booth with ornate teapot in hand. "More tea?" "I'd like some more tea, please," said Jenny. "Yes, of course!" The waitress poured the steaming beverage into Jenny's porcelain cup. "And for you, sir?" "I'm fine, thanks," said Pete. Once the waitress had left, Pete leaned in conspiratorially. "She believes in God." "The waitress? How can you know that?" "She saw that your cup is empty, but how did she know it was actually empty? Her eyes could have been deceiving her. How can she trust any of her senses? Ultimately, all she has to verify her senses are her senses, which is viciously circular. Viciously circular! With every knowledge claim she makes, she exalts the name of the Lord." "Huh." Jenny smiled, nodding her head. She brought the steaming cup to her lips. "I kind of like that." "Y-you do?" Pete blinked. "Really?" "Yeah, it kind of reminds me of Stranger in a Strange Land. Did you ever read that? Thou art God. The Messiah comes to earth, and his message is that we are all God, every last one of us. Thou art God, I am God, all that groks is God." "No, no, no! I'm not saying that we are all gods! I am saying that we all believe in the same God!" 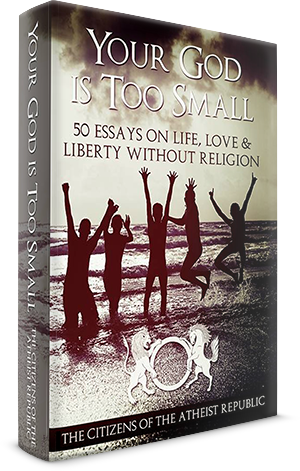 "Right, we all acknowledge, in our own way, the same life force which gave us life and holds the universe together…"
"God is not a life force! You're completely misunderstanding me!" "Will you settle down?" Jenny looked over her shoulder at the other patrons. "I'm just trying to draw parallels with other belief systems. I think it's important to…"
"There are no parallels!" declared Pete Perkins, balling his hands tightly into fists. "There is the God of the Bible and nothing else!" "But…" Jenny attempted to smile "If you're telling me that everyone believes in the same God, then how come there are so many different religions? Clearly, it's because…"
"Because the wickedness of man has perverted the true Word of God!" "Are you joking? You're joking, right?" Pete leaned back in his seat. "Why would you think I was joking?" "Well, because of the way you…"
"Was it your senses? Did your senses tell you I was joking?" "I guess. I mean, I just…"
"How do you know your senses are accurate?" "I don't know if they're one hundred percent accurate, but…"
"Then you could be wrong! Don't you see? You could be wrong about everything! Without God, you are left to a life of absurdity where nothing maps to any semblance of objective reality!" "But that doesn't make any sense! Why would..?" "Oh? Are you absolutely certain it doesn't make sense? You keep making truth statements, Jenny. How do you know it doesn't make sense? After all, you've already admitted your senses aren't one hundred percent accurate." "Will you stop it? Just stop it! Jesus Christ, you're driving me crazy!" Pete sighed deeply. He pushed aside his kung pao chicken and said softly, "If you feel like you're being driven crazy, it's because you're coming to recognize the inherent contradiction at the heart of all of your thinking. But I can help you with that." He put a hand on hers. "There is a way out, Jenny. I found it five years ago, and I can help you find it, too. What do you think?" "I think I should have stuck with BuddhistMingle.com." Next: The Date Continues…. Or does it?! I live just beyond the reaches of Philadelphia, PA with my beautiful wife and cool son, where we attend the oldest Mennonite church in the country. I believe that non-believers can and must have a positive voice in religious dialogues. When I'm not contemplating religion and faith, I write and tell stories and post long-winded reviews of picture books.